Chart with guitar chords. The chart gives an overview over some often used chords in the most common played keys. 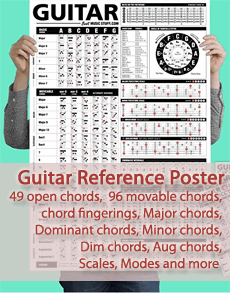 The guitar chart is printable with adjusted width to fit on an A4 paper for printers with 72 or higher dpi. If you are looking for more chords and various categories, go to the chords by notes section or chord by types section.